We are proud to announce the Dutch Malaria Foundation as a new Partner of the Fight the Fakes Campaign! The Dutch Malaria Foundation is a non-for-profit that aims to control malaria worldwide in order to structurally improve health, reduce poverty and stimulate economic development. Africa and Asia are hit hardest by malaria with over 1 million deaths due to the disease every year; every 45 seconds, a child dies of malaria. The Dutch Malaria Foundation works to combat malaria with innovative projects, working to make knowledge and information about malaria available to stakeholders around the world. 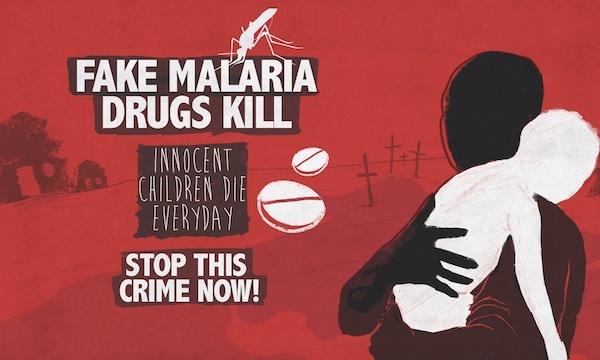 As part of the Dutch Malaria Foundation project “Fake Drugs Kill”, the organisation is calling on the public to sign the Juma Petition, demanding better regulation of medicines in China and India to stop the proliferation of fake medicines in Africa. To watch Juma’s story and sign the petition, visit Fake Drugs Kill. For more information about the Dutch Malaria Foundation, visit their website.